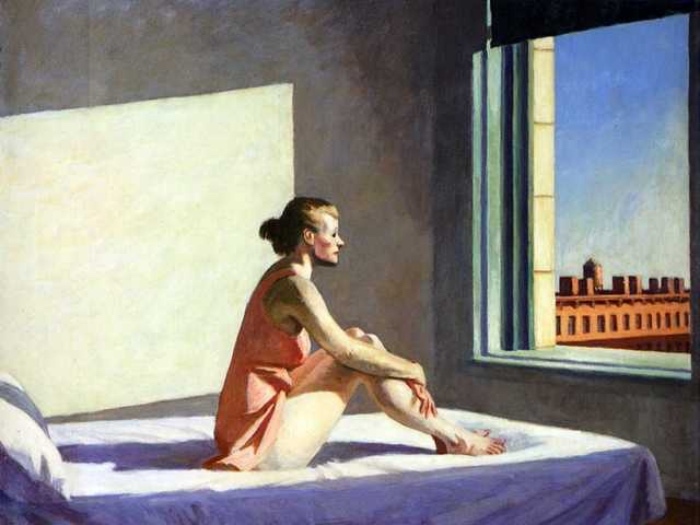 Edward Hopper life and works. 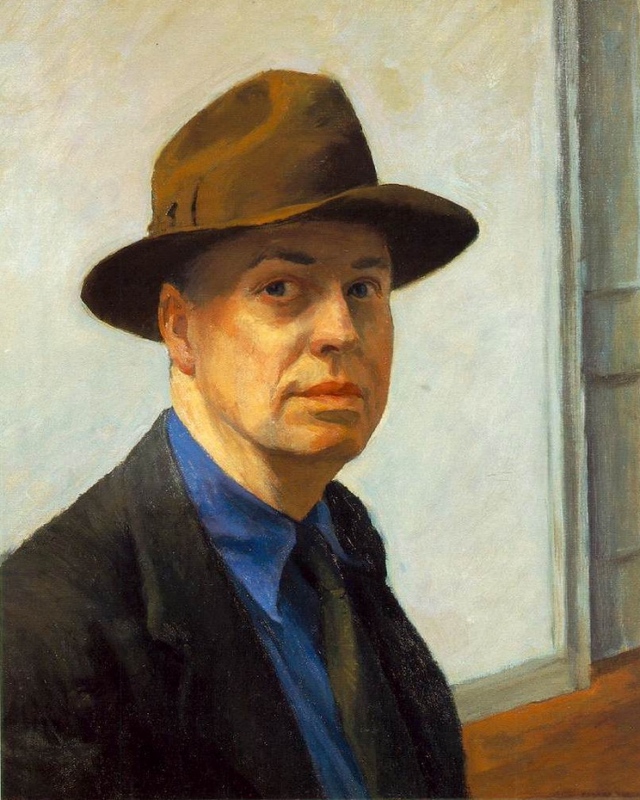 Edward Hopper was born in Nyack, a small town on the Hudson River on July 22th 1882, and during his long artistic career he created an image of America made up of anonymous places, silent cities, desolated cafés, houses in the middle of nowhere, and solitary men and women. Hopper studied at the School of Art in New York and completed his training through some trips to Europe between 1905 and 1910. When he came back to the USA, he started working as an illustrator for magazines and advertisement, a job he disapproved in his mature works of art. 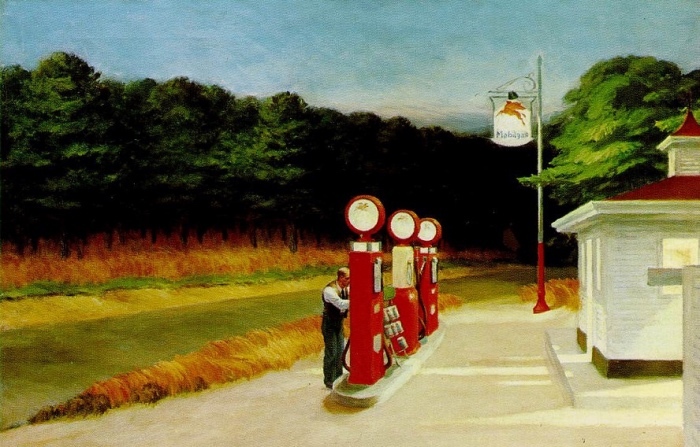 The painting Gas, painted in the 1940s when Hopper was already a famous artist, is the overturning of the advertising image. The petrol pump attendant is alone and there are no cars at the petrol station, whereas the wood doesn’t seem to be a comforting place. Around 1915 Hopper left painting in order to dedicate himself to etching, experimenting all the themes typical of his painting: the loneliness of the metropolis and people depicted in an ordinary and everyday moment. In 1923 Hopper met the artist Josephine Nivison who would become his wife and his model for all the female figures of his paintings. The painting in which the physiognomy of the female figure really corresponds to Josephine’s facial features is Morning Sun, whereas Josephine’s pink nightgown appears in the paintings City Sunlight and Summer in the city. Hopper achieved success when he was 40 years old, and after two exhibitions, one showing watercolours (in 1924) and one showing paintings (in 1927), which let him dedicate himself completely to painting. 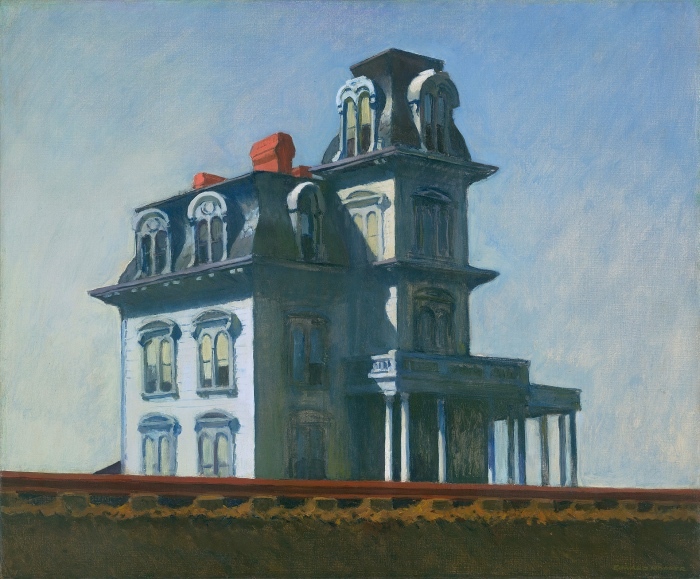 In 1926 the collector Stephen Clark purchased the painting House by the railroad, which would be the first painting by Hopper on display at the Museum of Modern Art in New York. 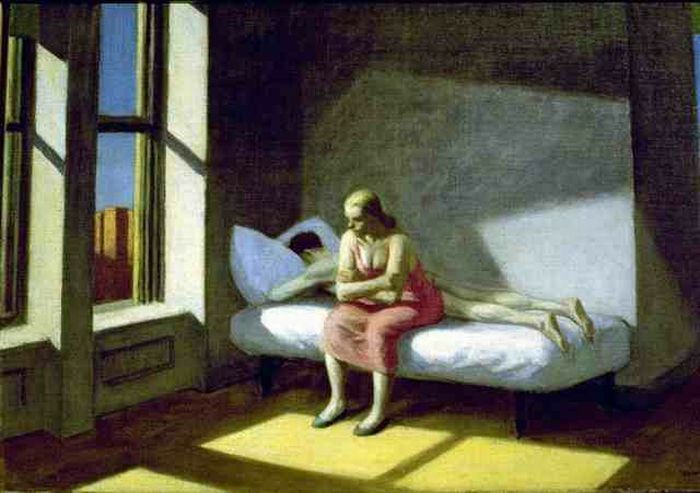 Hopper’s style of painting consists of a geometrical structure in which figures are placed in an essential space. SEE ALSO: photos by Richard Tuchman who reproduces and draws his inspiration from Hopper’s works. 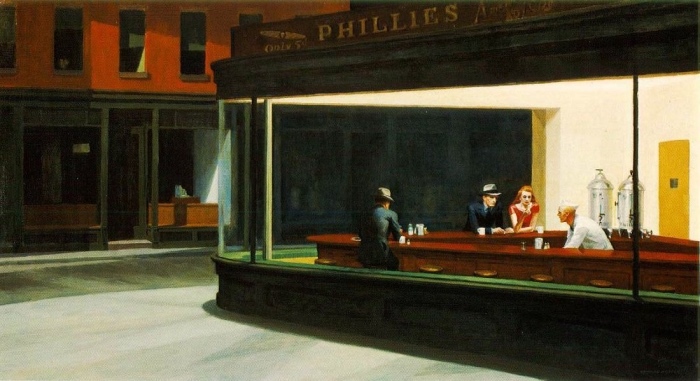 In 1942 Hopper painted Nighthawks, maybe the best-known and most replicated of his paintings. The artwork is a perfect summary of Edward Hopper’s art, because it represents a scene of ordinary life in a big American city by night. The characters depicted don’t communicate and the artificial light enhances the sense of loneliness permeating the scene. 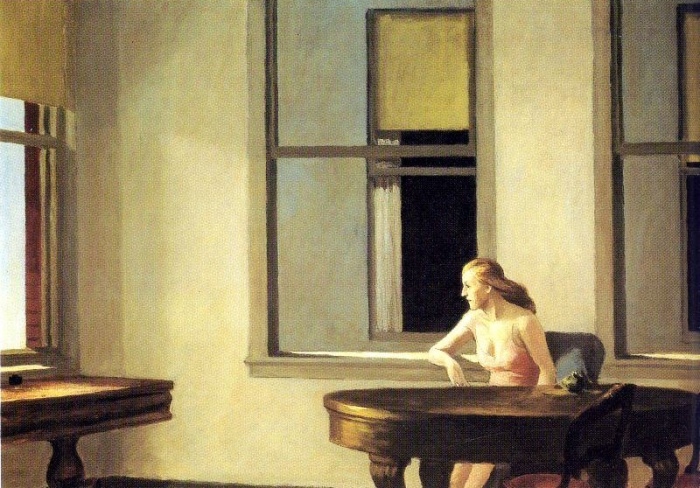 Hopper’s paintings are capable of telling stories although there aren’t many elements, inciting the imagination of the viewers who try to think about a scene coming just before or just after that image. Edward Hopper was the first American artist who looked at the banality of ordinary life and made it a masterpiece. Hopper died in 1967 after he had gone through the greatest changes in art and had witnessed the movement of the art scene from Europe to the USA, thanks to the success of Jackson Pollock’s abstract Expressionism. READ ALSO: the post in which I tell the story of Mural by Jackson Pollock which marks the beginning of American abstract Expressionism and has been recently exhibited in Italy. OOOh anche i riferimenti fotografici: grazie!